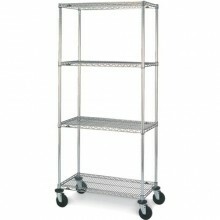 Super Erecta® stem caster mobile carts feature chrome finish wire shelving for easy cleaning and dust free storage. Shelves can be positioned at 1" increments along the length of the posts, so you can create the space you need. Comes complete with two swivel and two brake resilient rubber casters, and four shelves and four post. Click the button below to add the Metro N466BX Mobile Four Shelf Wire Cart with Chrome Finish, 21" x 60" x 67-7/8" to your wish list. 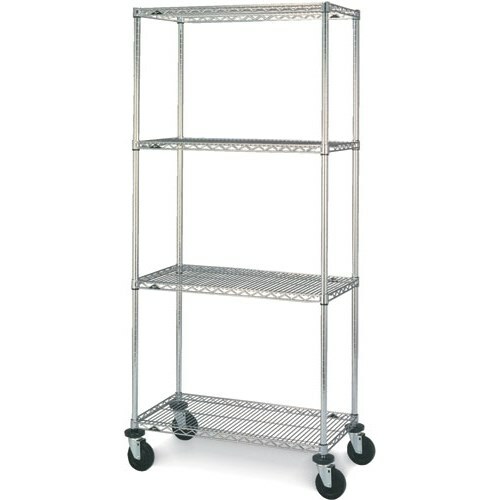 Metro N556BC Mobile Four Shelf Wire Cart with Chrome Finish, 24" x 48" x 67-7/8"
Metro N536BC Mobile Four Shelf Wire Cart with Chrome Finish, 24" x 36" x 67-7/8"
Metro N566BC Mobile Four Shelf Wire Cart with Chrome Finish, 24" x 60" x 67-7/8"